True Moroccan style with a sense of calm: Jnane Tamsna | Oh, the Places We See . . . Dramatic palm trees grace the arched entrance to one of the houses at Jnane Tamsna. As the driver pulled onto the property known as Jnane Tamsna, I could immediately feel as if a true Moroccan adventure were unfolding before me. Jnane Tamsna is like no other resort or boutique hotel in Morocco — or maybe anywhere — thanks to the impeccable design sense of its owner MeryAnne Loum-Martin, a lawyer from Senegal who studied in Paris. Together with her husband Dr. Gary Martin, a American ethnobotanist and founder of the Global Diversity Foundation, MeryAnne created an oasis near Marrakech that is now the only black female owned hotel in Morocco. 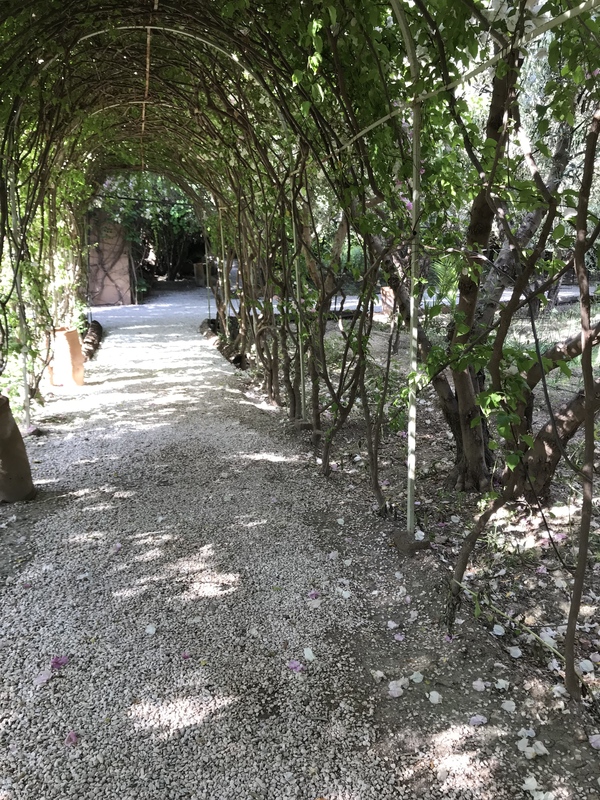 With its 24 rooms spread among five houses on nine acres, Jnane Tamsna has opened its doors, according to Essence magazine, to Brad Pitt, Tom Cruise, Giorgio Armani, and Donna Karen, but was my home for a week-long Culinary Journey in Morocco led by San Francisco chef Joanne Weir. The simple yet dramatic entrance to Jnane Tamsna. The sense of calm is evident upon arrival. 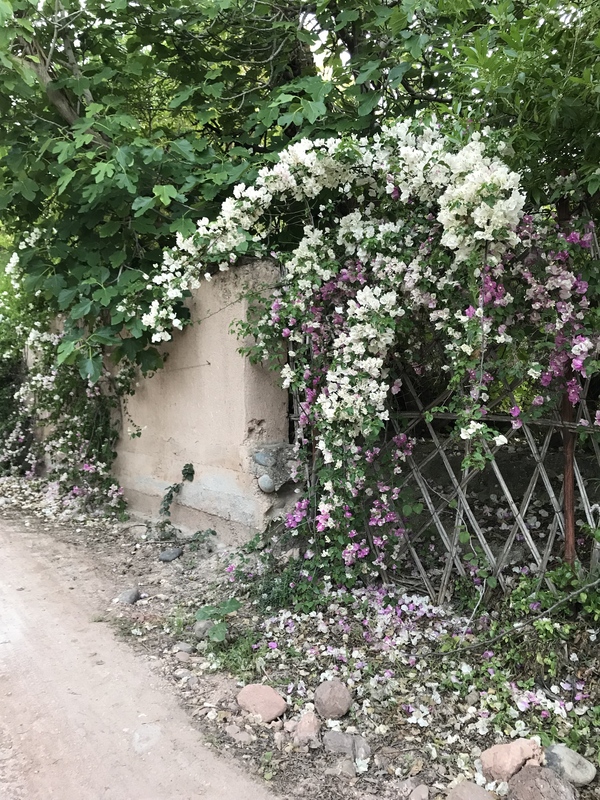 With a single palm at the entrance, a series of archways led me through the simple, yet elegant main entrance complete with roses floating in a crystal bowl sitting upon a typical Moroccan inlaid chest. An open book on another invited me to register as a guest. Floating roses atop an inlaid chest invite guests in for a stay at Jnane Tamsna. The living room became a favorite for me and others with its velvet chairs, indigenous art, and soft lighting. An alcove in the main room invites guests to spend a private moment sipping mint tea offered upon arrival. And books stacked willy-nilly make anyone feel right at home. Comfortable alcove flanked by bookshelves invite guests into the main room at Jnane Tamsna. Outside, gathering places remain intimate, offering a respite from the jangle of the crowded souks in downtown Marrakech. Favorite outdoor lounging area with painted tryptych and carved wood panel. 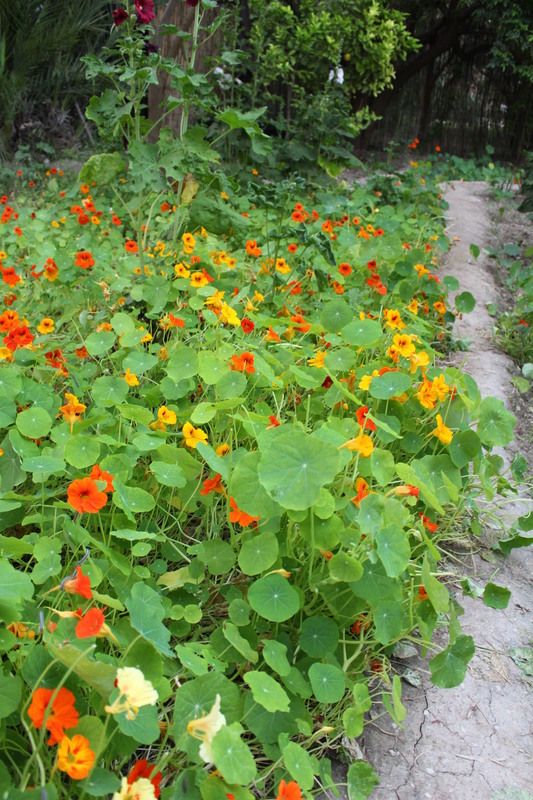 A stroll through the gardens reveals native plants marked for ready identification. 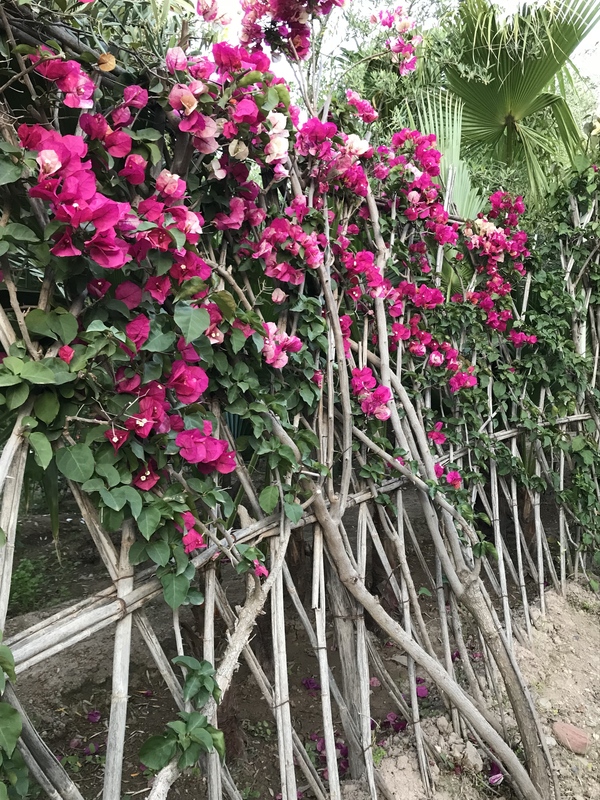 Natural pathways offer closer looks, especially if they’re bordered by twig trellises and blooming bougainvillea, but they’re also where guests wind down on their way to beautiful lodging rooms. Some of the houses offer spots for gathering. With their Moroccan furnishings — tapestries, weighty furniture, patterned rugs — guests take in the sensory stimuli reminiscent of the beauty of the area. An outdoor gathering spot takes in the afternoon sun through the vine-covered archways. Three rooms that I visited were all different. Painted a deep purplish red, one room was a study in contrasts: cream-colored floor-to-ceiling curtains hung loosely and a patterned rug offered more texture and design. In another, twin beds under a lush canopy awaited guests and offered a sprig of rosemary on the pillows. Adding drama to this suite called Calligraphie for its frieze of Arabic writing near the ceiling, was an African garment displayed at the end of an arched hallway. A third room held a welcoming basket of freshly-picked flowers. Dining, too, is an experience at Jnane Tamsna. At one end of the back dining room hangs a colorful, patterned textile and multiple framed portraits. On the ceiling, twigs woven into a grid form a nature-inspired covering. Moroccan patterns in the dining room. 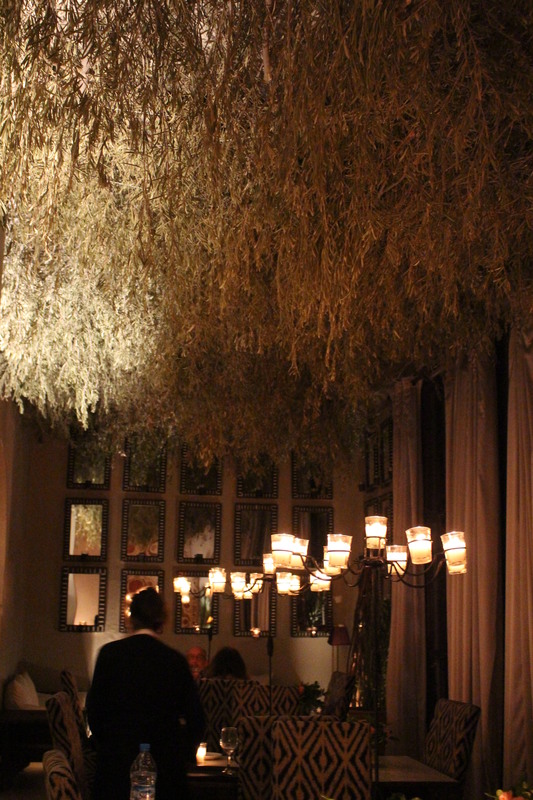 Branches woven into a grid adorn the ceiling of the dining room at Jnane Tamsna. It’s no wonder that people book Jnane Tamsna for special occasions — wedding receptions, reunions, corporate retreats, cooking schools, and the like. After all, who wouldn’t want to dine at tables set under the trees overlooking an elegant pool? Dinner setting under the trees. 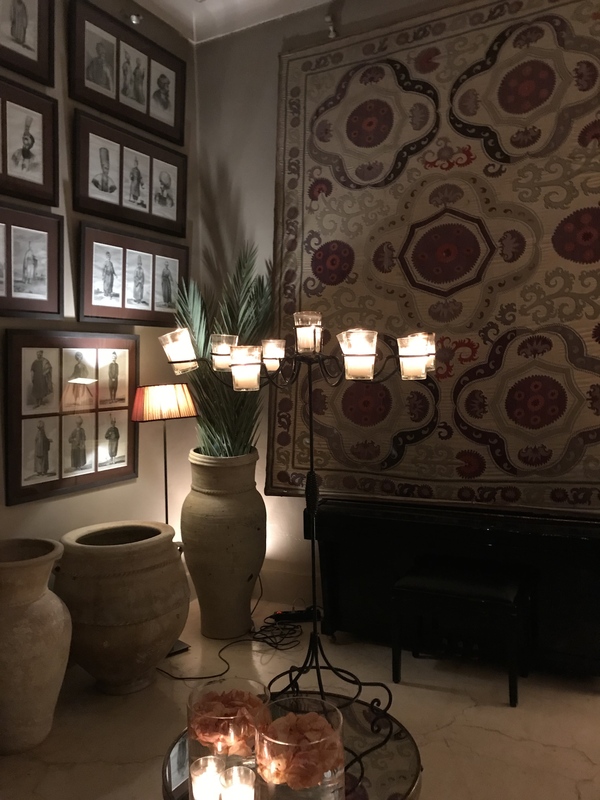 Of course, the real treat at Jnane Tamsna is the cadre of people who are ready to serve, to answer questions, to guide you in your travels, and to make you feel at home in this serene oasis right outside Marrakech. I hope you’ll follow along as I share glimpses of my Culinary Journey in Morocco 2018 with Chef Joanne Weir. You can’t help but feel the calm and fall in love with the setting that, to me, was the best introduction to Morocco anyone could have. 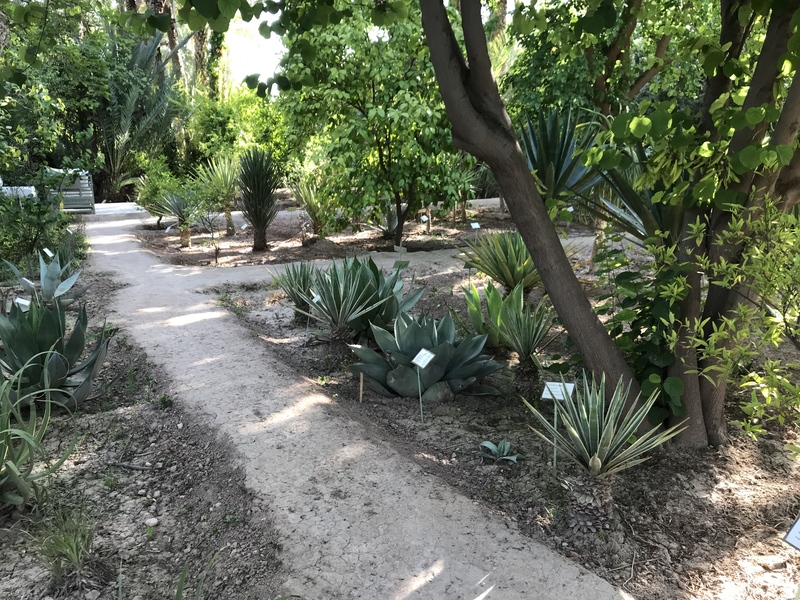 This entry was posted in Marvelous Morocco, Morocco and tagged Culinary Journey to Morocco, Dr. Gary Martin, Jnane Tamsna, Joanne Weir, Marrakech, MeryAnne Loum-Martin, Morocco. Bookmark the permalink. Amazing places, beautiful photos! Thanks for sharing! Thanks so much for taking a look and leaving a message. This was one great trip. Our guide tried to show us cultural aspects as well as the usual go-to tourist spots, so we think we saw a lot in a short time. What a beautiful adventure this must have been! Absolutely awesome! This was one of my best trips ever — very endearing people, lovely architecture, and a fascinating culture with more similarities to ours than you can imagine, yet so different. Hope you’ll continue to hang in there with me — I’ve got more to show! Thanks so much for taking a look and commenting on the title — this really is a calming place! Stunning photos and vivid narrative! I want to go with you wherever you go in person or virtually. Beautiful place and terrific post, Rusha. What an incredible place to have a culinary adventure! Thanks so much for taking time to look and comment. This was an incredible place to learn about the culture and cuisine of Morocco — and wow! what an introduction. I felt quite special in Jnane Tamsna, but I also felt special in many places. It’s the Moroccan way with tourists — they treat you so well. Hope you’ll stick with me — more pics and tales to come. Thanks so much for joining me on this journey. Hope you’ll take a look at a few other places in Morocco — coming soon! Oh so beautifully decorated. Love the colors and lighting you captured. Thanks so much! It was a lovely place. And I liked taking pictures when the sun streamed in and cast great shadows! What a fabulous adventure Rusha! And such an amazing spot to start from. Can you see the green of envy in my eyes?!?! I never dreamed I’d be staying in a place like Jnane Tamsna. What an adventure! But also what a learning experience. You would be in photographer heaven!